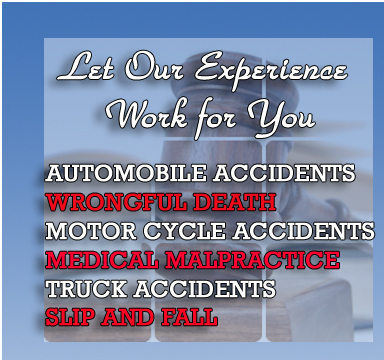 Mr. Traub has extensive experience with personal injury work. Before attending law school he worked as a claims adjuster for Travelers Ins. Company where he learned how the claims department operated and how adjusters and supervisors were trained to work their cases.personal injury attorney Atlanta When he began his practice, it seemed natural to do personal injury work because he knew he could work with the adjusters and relate to them as a result of having been in their position. Mr. Traub has extensive experience in cases involving AUTOMOBILE ACCIDENTS, WRONGFUL DEATH, MOTOR CYCLE ACCIDENTS, MEDICAL MALPRACTICE AND SLIP AND FALL.